Heidi has provided her Fab laundry detergent reviews for both the powdered and liquid versions. I prefer powders for the most part, but I have used the liquid. For me, powder is more economical and does a better job. Fab powder and liquid are very reasonably priced and, considering today's economy, that is very important to me. It does poorly on heavily soiled or really stained clothes, but for everyday washing it does just fine. I have an HE front loader and even though this is not made for HE machines I have had no problem with the powder oversudsing what-so-ever. Clothes come out clean and smelling fresh. The liquid, however, gave me some problems so I would recommend the HE version of Fab if you prefer liquid. I noticed in some other reviews people are having trouble finding this detergent in stores. I usually get mine at one of our local dollar stores, but I have seen it at Walmart too. I hope that helps those who are having trouble finding this brand. It's an old reliable that has not changed much over the years and that is why the price has stayed economical. Thanks so much Heidi for your Fab laundry detergent reviews, plus I LOVE that you sent a picture! I hadn't seen the powdered Fab boxes, so having this picture is very helpful. Since I first wrote about Fab I have also started to see it, at least in the liquid version, at my local Walmart. I'm glad Heidi provided more places for people to look for it if they're interested in trying it out. In fact, I've noticed more lower cost detergents popping up on more store shelves lately. I think this reflects the need that people have for lower cost varieties during this economic downturn. If any readers have tried a lower cost detergent, I would love to hear a review, because people want lower cost, but still want to know what works best! If you have a review, please share your laundry detergent review here for this or any other brand. Join in and write your own page! It's easy to do. How? Simply click here to return to Fab laundry detergent. April shared her short and sweet review of this detergent. I do not like this detergent at all. I put 2 cap full and still had no suds. Thanks April for sharing your opinion and experience about this detergent. I would be curious to know if the detergent you used was HE compatible, or not? The reason I ask is that detergents which are designed for HE machines don't typically make many suds, because these machines use much less water to clean your clothes than the older, top loading machines, and suds make the machine not work properly. Although we are conditioned to like suds, and believe they show the product is working, these technological changes could change the meaning of this observation. I've written an article about low sudsing detergent here if you want to learn more. On the other hand, if it was not the HE version perhaps you've got something legitimate to complain about. I would be interested to hear how the detergent actually cleaned the clothing, since that is a better test of it than the amount of suds it creates. I hope that helps! I have to use a 1/2 bottle of Fab to make suds. That's not a great deal even if it is on sale with a coupon. I have used Fab in the past with no problems, but not now. I bought this at Walmart, but I think I have to use too much quantity, cause there's no foam in the water. Here's yet another comment from another SR101 reader. I bought Fab liquid and it is the worst. The smell is very nice but I've used up to 3 capfuls of the detergent for ONE load and still NO SUDS. I will never purchase this again. What is the use of getting it because it costs less when I am using 3 or 4 times the amount and still no suds?? I received this complaint about Fab powdered laundry detergent from a SR101 reader. I have a complaint against the powder detergents. I find it will not dissolve in my washing machine. I tried letting it set for a while in water, but it is still not dissolving. The colored clothes have undissolved powder on them so I have to run them through clear water again. This is expensive. The product is Rain Forest, and the other unopened package is Spring Magic. I will not be buying anymore powdered detergents from Fab. Sorry to hear you didn't like the powdered version of the detergent as well as another reviewer above. I have a suggestion for you though, that you may want to try to salvage these boxes of detergent you've already bought, even though I understand why you would not want to buy more in the future. Sometimes powdered detergent doesn't dissolve well, especially in cold water. If that is the case in your area you can try first dissolving the powder into a very hot cup of water first, and then pouring this mixture into the machine like you would add liquid detergent. I don't know if that will solve your problem or not, but it is worth a try! So, does anyone else use powdered Fab detergent? Like I said previously, I can't find much information about it online, and have actually learned more about it from the reviews I've received from SR101 readers. Can anyone else share what stores they've found it in, and their own experiences with it? I would also love to hear more about the liquid version of the detergent. You can share your Fab laundry detergent review here, or read more information about it. Allie shared this review of the stain fighter and color booster variety of this detergent. My daughter just purchased a container of Fab Stain Fighter & Color Booster. I have to say it was not the product I usually buy, so I put it on the shelf. Just recently my husband gave me a stack of towels and rags he uses in the garage on cars. I used the Fab and boy could you see a difference at once. 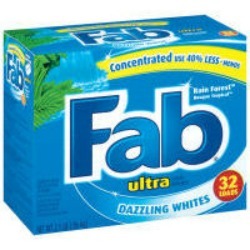 I have to say I tried it on our laundry and am happy to say I am now a Fab customer. Thanks so much for your review of this detergent Allie. I would love to hear from even more people who've used this type, to share how it worked for them too. Amy also had problems with the powdered version of this detergent dissolving in the wash, and unfortunately it appears that my suggestions from above, for another reader didn't work for her. I have been a dedicated Fab laundry detergent customer for many years. I was very disappointed because I bought 3 large boxes of Fab original scent detergent at a local store and when I took it home to use for some reason it would not dissolve. I had to rinse each load 4x to get the white stains of the detergent off my clothes. I tried hot water and letting it sit in the water for a few minutes before adding clothes, but that did not work. I also I tried less than the recommended amount per load and still the same. I went through the 4 boxes and they were all the same. I had to buy Tide to be able to get all the stained clothes with the Fab powder detergent off my clothes. I really loved Fab and would love to go back to buying it but it cost me more money and wasted time just to wash each load of laundry. Amy, that would be quite disappointing and aggravating. I'm sorry the ideas I had above for the above reader who also had this problem didn't work for you to salvage the detergent. If I were you I would definitely call Fab's customer service line and complain about this issue, and perhaps see if you can get a refund. Has anyone else had this issue with the powder not dissolving properly? You can share your Fab laundry detergent review here, or read more information and reviews of it. Well, I'm not a "mom," but I'll share my reviews on this product. Fab has been around many years, although you don't see it much on shelves any more (at least not in my area). So I was surprised when I recently stumbled onto it in Family Dollar. The price was $2.75 for a 50oz. jug of Spring Magic, which was the only fragrance they carried. Since I remembered Fab from years ago, and the price was really good, I decided to buy it. I'm glad I did. I do a lot of automotive and yard work, where my clothes get very dirty and sweaty, so I ask a lot of detergent. This one cleaned like a champ and made even the sweatiest and dirtiest jeans and shirts look and smell great. No complaints on cleaning performance, and you can't beat the price. I recommend it! One of the best cheaper alternatives in laundry detergent. I would say it smells and works just as well as Gain. I bought mine at the family dollar for around $4 for 88 loads. 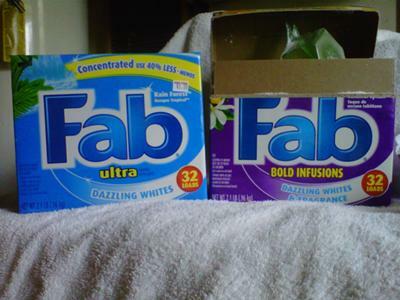 In 45 years of doing laundry I haven't found any detergent as good as Fab. All the clothes come out "crisp," very clean, and pleasant smelling. 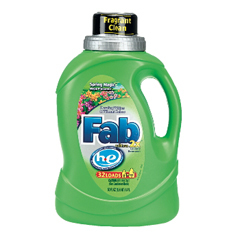 The only location I can find Fab is at Big Lots. Unfortunately, Phoenix Brands which manufactures Fab has filed for bankruptcy in May 2016. Depending on whether it is bought out this product possibly may not be available again. When I first started using Fab laundry powder detergent it made my laundry clean and smell nice. However after almost using 3/4 of a 2.3 kg pack of it, I noticed my clean laundry smell horrible. I opened another pack of it. Again at first, it worked fine but after that, it smelt so 'unwashed'. I still have 2 unopened packs with me. I have lost confidence in using it. Any refunds please?